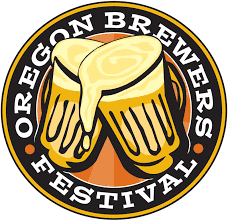 Oregon Brewers Festival (OBF) is a five-day craft beer festival held annually since 1988 at the Tom McCall Waterfront Park in downtown Portland, Oregon. OBF has become the most popular outdoor beer festival in North America, based on attendance. Admission is free, but to sample the festival's beers, attendees must purchase that year's OBF tasting glass as well as $1 beer tokens— each token is good for a sample that has varied in volume over the years. while a "full pour" costs four tokens. Each brewery brings one beer. OBF also features a root beer garden, which offers free root beer for designated drivers and minors; the latter must be accompanied by a parent. In 2005, OBF expanded from a three-day schedule (Friday to Sunday) to four, adding Thursday. The 2011 Oregon Brewers Festival featured 85 craft beers from 14 states; it attracted 80,000 people over four days. Nearly 2,000 volunteers worked at the festival, selling tokens and pouring beer, among other tasks. In 2013, OBF added a fifth day, moving the opening to Wednesday; they also replaced the annual plastic mug, which had been used since the festival's beginning, with a tasting glass, which for 2013 costs $7. The previous year's 14-US-fluid-ounce (410 ml) mug was replaced by a 12.8-US-fluid-ounce (380 ml) glass, which reduced the size of a full pour. For 2014, there are 88 beers available, in 30 styles; that does not include the more than 100 available separately in OBF's Specialty Tent. After two years with tasting glasses made of glass, for 2015, OBF switched to a polycarbonate tasting glass. The change was in response to safety concerns raised by the Portland Police.